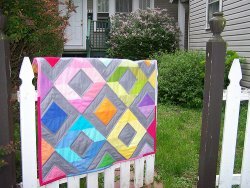 By using charm packs to create half square triangles, Lindsay creates a fun pattern with this mini quilt. The overall rainbow theme contrasted with the dark grays really bring out the bright colors in these fabrics, making them pop. This quilt really makes the fabric shine. Mini quilts make great gifts! 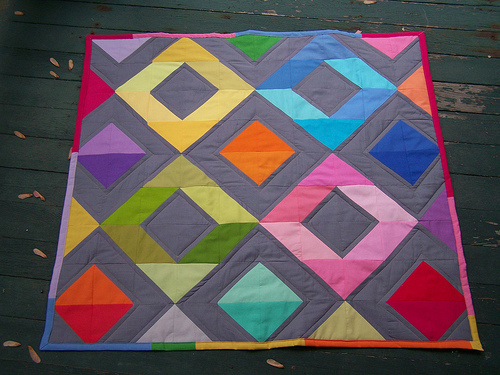 "For this quilt, you can go bright with rainbow solids like I did, or focus on prints. Choose masculine colors, girly colors or whatever you like. 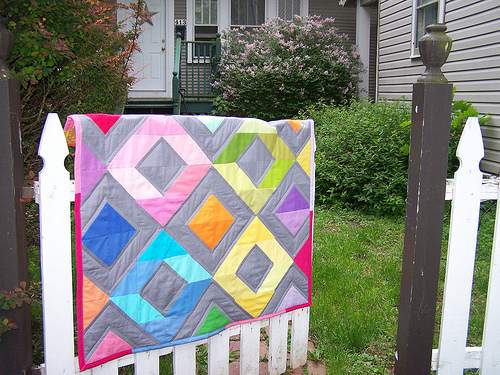 Once you learn the basic technique of sewing half-square triangles, the options are endless!"